The Alzheimer’s Association is inviting Peachtree City and surrounding area residents to join the fight to end Alzheimer’s by participating in the Alzheimer’s Association Walk to End Alzheimer’s. 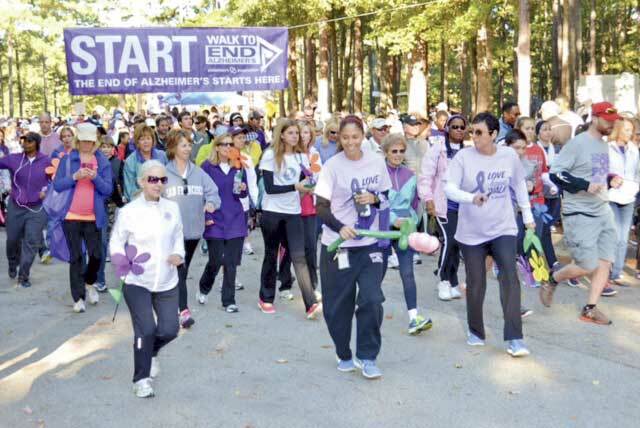 The Walk is Oct. 6 at Frederick Brown Jr. Amphitheater in Peachtree City. Alzheimer’s Association Walk to End Alzheimer’s participants will complete a three-mile walk and will learn about Alzheimer’s disease, advocacy opportunities, clinical studies enrollment and support programs and services from the Alzheimer’s Association. Walk participants also honor those affected by Alzheimer’s disease with the poignant Promise Garden ceremony. “Like so many others, Alzheimer’s has affected my family and I understand the toll it takes on the person afflicted, their families, and caregivers. It has been an honor to chair the Southern Crescent Walk the last seven years and I appreciate the efforts of all those involved.” says Sue Shaffer, walk chair. In addition to the three-mile walk, participants will enjoy a family friendly event where walkers, runners, wheelchairs, strollers and dogs are welcome. The eighteen-piece Peachtree Jazz Edition is on hand to play music as well as an area for children. The event will also include a raffle after the walk concludes. Sponsors include Heartis and the Neuropsychology Center. More than 5 million Americans are living with Alzheimer’s disease, the sixth-leading cause of death in the U.S. and the only disease among the top 10 causes that cannot be cured, prevented or even slowed. Additionally, more than 16 million family and friends provide care to people with Alzheimer’s and other dementias in the U.S. In Georgia alone, there are more than 140,000 people living with the disease and 527,000 caregivers. The Alzheimer’s Association Walk to End Alzheimer’s is the world’s largest event to raise awareness and funds for Alzheimer’s care, support and research. Since 1989, the Alzheimer’s Association mobilized millions of Americans in the Alzheimer’s Association Memory Walk; now the Alzheimer’s Association is continuing to lead the way with Walk to End Alzheimer’s. Together, we can end Alzheimer’s. The Alzheimer’s Association is the leading voluntary health organization in Alzheimer’s care, support and research. Our mission is to eliminate Alzheimer’s disease through the advancement of research; to provide and enhance care and support for all affected; and to reduce the risk of dementia through the promotion of brain health. Our vision is a world without Alzheimer’s. Visit alz.org or call 800-272-3900.